Exciting Announcement: Changes to our website and company profile. We’ve updated our website and added some pretty sweet stuff including pictures, new pages and more. Some of the new features and features coming to our website: Easy Navigation, Job Opportunities, Insurance Claim service for building and home exteriors, A whole lot of great products like: customized siding and windows, building maintenance, project management, general contractor service, a world class management training program and more. Posted on May 11, 2012 Author creektuberCategories Uncategorized1 Comment on Exciting Announcement: Changes to our website and company profile. Skyline park, what’s hiding under there? Is there a structure under the grass? A small crew from Allied digs a trench to lower the sprinkler line where the ice arena is setup annually. Upon digging they found waterproofing with drainage. Is something hiding under the park in Denver?? 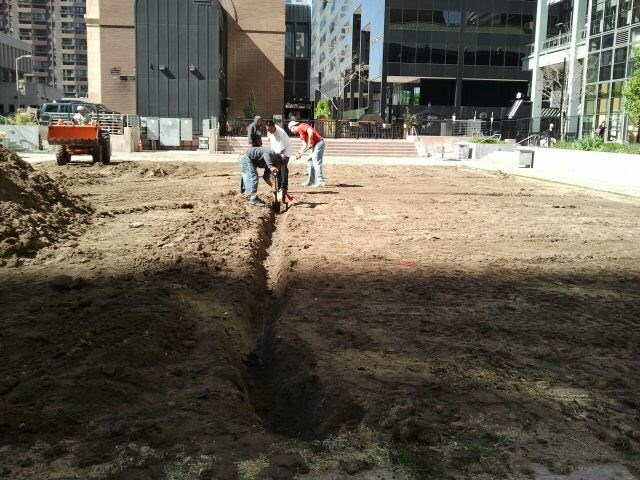 Posted on May 6, 2012 May 7, 2012 Author creektuberCategories Downtown Denver, landscaping, UncategorizedLeave a comment on Skyline park, what’s hiding under there? Advertising is good, but not always effective. The 1989 Baseball movie Field of Dreams was about a farmer who heard a voice inspiring him to build a baseball field and the end result was the Black Sox coming. You can watch the movie to get the full understanding. The truth about reality is this “If you build the wrong thing, it will be a lot of waste”. Kevin Costner’s character in Field of Dreams was not presented with an advertising problem, he was presented with a “possible” problem and the movie was entirely fictitious in the respect that legendary baseball teams could reappear from the grave and play a ball game in Iowa. Sham-Wow probably costs a couple of pennies to produce, the advertising is costly, people bought them. Blankets with arm holes have become a huge market because of the advertising, availability and perceived value. If a product is marketed and unavailable to the consumer for any reason the marketing will not give a good return on investment. If a product is marketed and the ads fail to properly add value to that product then consumers will not see the value. Value must be built in and the products benefits must be apparent to those who are forking over the dough. Nobody will spend money on something they don’t value…. or won’t spend it willingly. Gold has always been hard to come buy, it can be stored in abundance, but only with great effort. It’s rare, beautiful, hard to come by and perceived as valuable for its many qualities. People throughout history have used gold and silver as money. Money is defined by a variety of things and can be manipulated in the market when it is not rare, beautiful, hard to come by and has a perceived value that is forced upon the marketplace by things like: fiat currency, printing money on demand aka counterfeiting, shortages of food and water. Prices of food, shelter and any commodity become higher when the supply of those goods is in danger of running low, during times of drought, war, money counterfeiting and many more things. The marketplace is not affected by only one factor. If there is a monopoly over any commodity including money, it can be more easily manipulated. How can a company better target the market according to what people need? How can a business grow when the economy is in a downfall? Who would be the best person/group of people to take a struggling economy and creatively meet needs and make a profit? Where should advertising dollars be spent? How can a company best follow the money trends, follow the money and meet the needs of consumers? How can a business find the best target market at all times and grow successively? The thing I love about business and the marketplace is that there is never just one correct answer, but many correct answers. The best answers are the highest in regard to people. I mean, ethical business attracts ethical people. Enron used the lower answers as a model and robbed a lot of folks. I hear the stories first hand in the homes of a good number of people, tidbits here and there. It was devastating. Spending money in the wrong place is just painful no matter what. A wise man once said “if you want to make money, you’ve got to go where the money is at.”, he then reached into his pocket and payed the bartender for his twelfth round. Years later that same wise man was still using the same stool to sit on, the same pants and the same 5 dollar bill on a string. The wise man had a lot of great information, but failed to properly divulge it. Marketing is the same as wisdom, if wisdom is applied to the correct people in the correct ways it will flourish and prosper. Marketing must be done in the absolute least expensive way possible by using existing resources. People with a great attitude and smile are better than anything. Posted on May 6, 2012 November 23, 2013 Author creektuberCategories baseball, business development, business management, economics, marketing, movies, salesTags Advertising, Field of Dreams, Marketing, Target market2 Comments on If you build it, they will come.